Nothing says, “you can commit violence now” like the end of the world. If the zombies are coming, who can blame you for shooting them? If the aliens are invading, you have every excuse to shoot you some aliens. That’s part of the reason the news is always filled with apocalyptic warnings about how ISIS is the greatest threat the U.S. has ever faced, or how we live in uniquely dangerous times. We need to convince ourselves that we’re more at risk than during World War II, or how else can we justify bombing people? The apocalypse serves a similar function in superhero comics. Giant purple dudes show up with funny hats and plans to devour the planet; psychic gorillas conquer the world. The apocalypse, in forms terrifying and ludicrous, is a monthly occurrence, not to mention a marketing plan. Ever since DC’s Crisis on Infinite Earths maxi-series in 1985, end-of-the-world events have served as a means of tying the shared multiverse together in a single, buy-them-all storyline that gives everyone a chance to hit each other all at once. Hawkeye, you take Hulk. Cool? Thanks buddy! 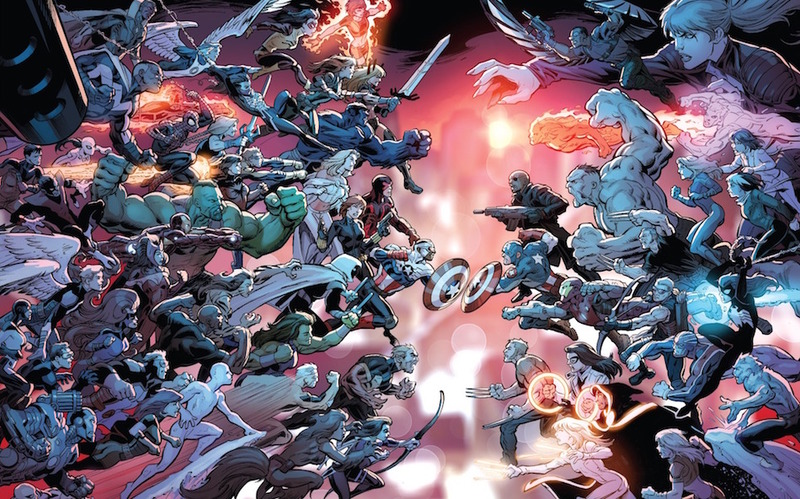 Marvel’s latest end-of-world venture is called Secret Wars, and it involves a multi-dimensional threat so wrapped up in nonsense continuity that I frankly can’t make heads or tails of it. Something to do with universes merging; something to do with a battleworld. It’s difficult to care much. Psychic gorillas would have been more fun. Still, however convoluted, the apocalypse does its job, providing an excuse and a background for superconflict and superviolence. Except in G. Willow Wilson and Adrian Alphona’s Ms. Marvel, #16-#19 — The Last Days of Ms. Marvel, as the story arc is called — where the editorially-mandated apocalypse is surprisingly, insistently low key. Ms. Marvel, aka Kamala Khan, is a Pakistani-American, a Muslim, and a woman of color; as such, she’s got a different relationship to apocalypse, and to violence. The end of the world, it turns out, looks different from the margins. 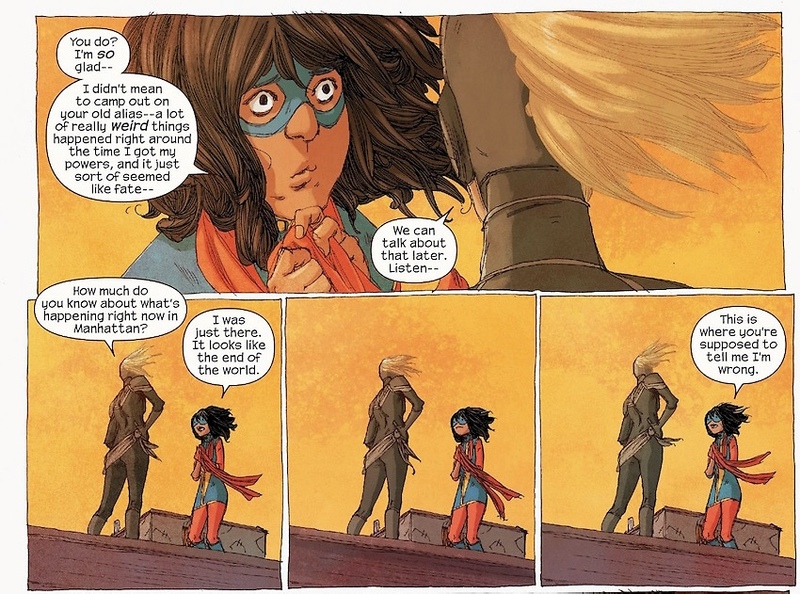 The beginning of the The Last Days of Ms. Marvel starts huge, with Kamala bearing witness to a planet floating over Manhattan on a collision course with Earth # . Only she never really finds out why or what it’s doing there because she immediately starts running full out with her shape-shifting, leg-stretching powers towards her home. 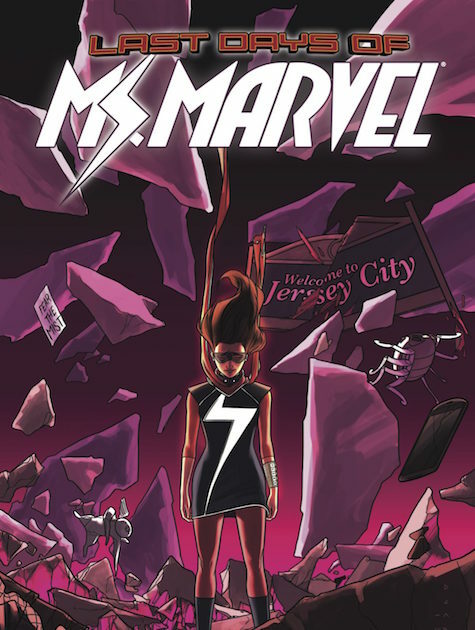 Kamala’s instincts aren’t to fight the planet in an apocalyptic showdown — as she immediately realizes, her shapeshifting stretchy powers are no match for an entire planet — they’re to try to beat the panicking crowds from Manhattan before “they all end up in New Jersey!” Once back in her native state, she spends the last hours before the destruction of the earth protecting friends and family, attending to abandoned kittens, and trying to rescue her brother who was kidnapped by her ex-crush, the douchebag supervillain-henchman Kamran. 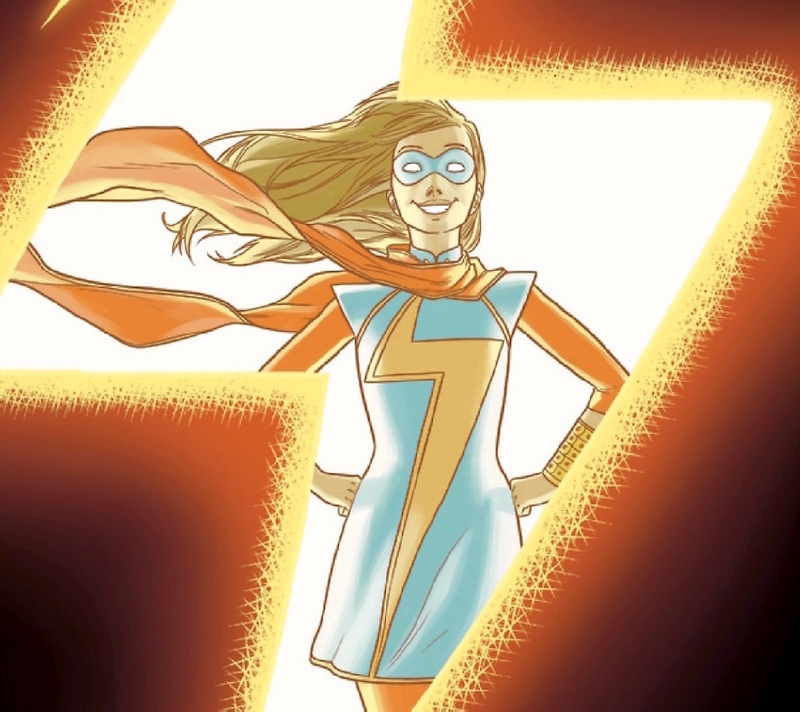 Part of the reason the world ending doesn’t need to lead to violence in Ms. Marvel is that Ms. Marvel herself isn’t at the center of the world. The end of the world warnings in the news these days are almost always about Muslim terrorism, and what violence we need to unleash to protect ourselves. Obama or Trump present themselves as the big heroes, promising explosions and superpower action to save everyone in a big, enthusiastic rush of violence. Kamala, though, doesn’t want to go out with blood and fire. We all face the end alone, and we alone have to account for our time on earth…What will be in the book of your life? How will you be remembered? 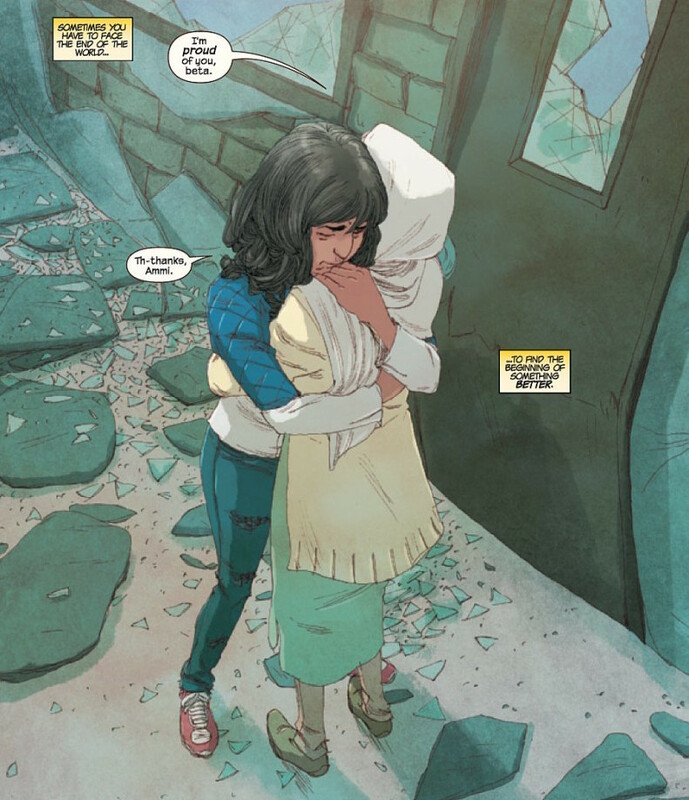 As a Muslim, as a woman, as a hero, Ms. Marvel offers a different narrative, about how people on the margins matter, and care for each other, even when the cameras focus on the giant purple guy stomping through. Love what you read? Patronize Noah Berlatsky.